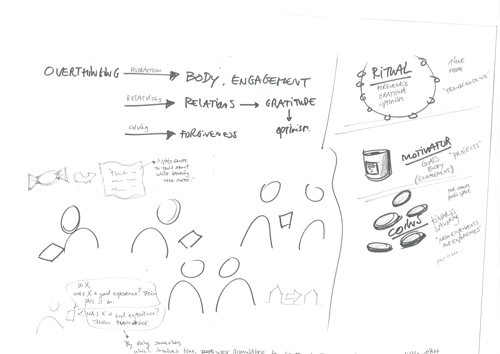 After having explored several aspects of the storyboard, the concept has been developed in detail. 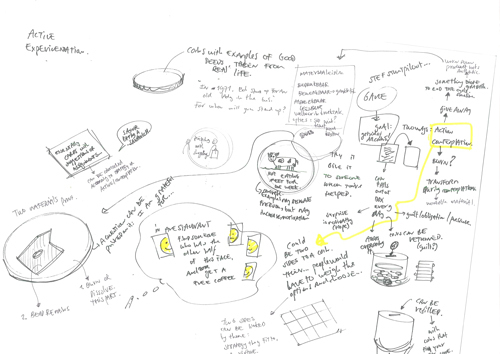 The many explorations from sketches and thoughts have been condensed into a final concept description. The assignments on the coins are small, specific examples and suggestions that aim to offer the user a new experience. They try to keep the threshold as low as possible, by being small (little physical effort), specific (little brain cycles trying to think what to do), offering a new experience that seems good (authenticity) or fun (hedonism) (instilling hope and wonder in the user), and by giving an example (the user can easily visualize it, and can visualize himself doing it). After carrying out an assignment, the user logs into a special website, using the unique code that is printed on every coin. He then types a small testimonial, describing what act he committed and how he found the experience. After having finished the testimonial, the user should give the coin to a friend or stranger, who should then also complete the assignment, type his own testimonial, pass it on, etc. If this system works, slowly a story will start to emerge around the actions witnessed by a single physical coin. The coin may spread from town to town, and cross various groups of peers and family along the way. After a few pass-overs, it is bound to belong to someone unknown to the initial user. The system can have a number of benefits. For the initial user, any act that follows upon his act in the chain is a reward, since he has set the chain in motion. For the recipient of a coin, the previous testimonials can be an inspiration and motivation to continue. As the chain grows larger, the reward and motivation increases, and the coin gains mythical stature. The fact that the chain is formed by a physical object traveling through the real world, makes it much more special than if a virtual object were to travel through the digital world. No matter how low the threshold is for exercising the act, the chain is bound to stop somewhere. This is not a bad thing. Say that the initial user buys a container and 30 coins. If 20 chains stop immediately after the coins have been passed over once, there may still be ten chains left that can be tracked. When buying the coins, the user buys new experiences. The chains are bonuses. Even if a chain is broken, a coin may pop up after a while, and continue its journey. 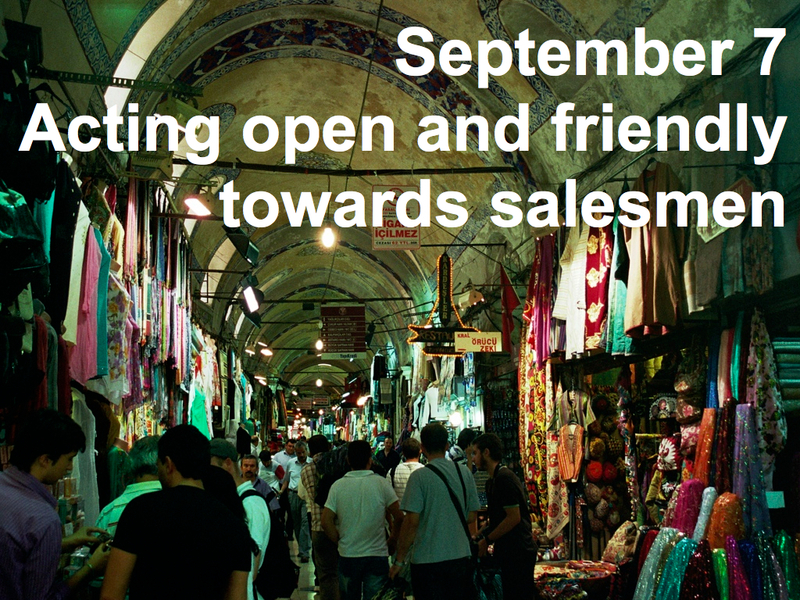 From the locations of users in testimonials, the coins can be tracked across towns, countries and continents. There is a great factor of serendipity in this system. People that by chance receive coins from friends or strangers are suddenly part of this intriguing network. There is no predefined order or planning for the execution of the assignments. The user can himself decide in what order and tempo to exercise them. This makes the product very flexible. By placing the container in the home environment, it acts as a silent reminder of the user’s commitment to adopting the strategy, and will no doubt evoke an emotion of guilt when the user neglects to exercise an assignment for a long time. The container acts as a clear goal at the same time, and observing how it slowly empties may motivate the user to keep on going. During the completion of the assignments, chances are that the user will already get some feedback of chains that are growing, which will be a further motivation. After having emptied the container, the user has experienced a lot of new things, has given this opportunity to other individuals, and has been able to review some of their experiences. And all this in relation to the happiness strategy that the user is adopting. After having developed my concept, I’ve looked in on similar available product-services on the market. As it turns out, there are some products that are very similar to the concept. First of all, this is a sign that the concept might work in practice, which can support my design decisions. However, it also makes the concept less unique. This graduation project has to add value, and therefore it may be wise to differentiate the concept from product-services that are already on the market. I will try to draw some lessons from these case studies, and describe a way in which my concept can be improved and differentiated, while still fitting the design vision and research outcomes. 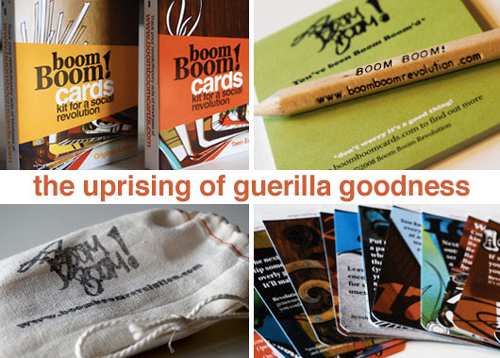 Boom Boom Cards are cards that stimulate users to commit acts of kindness. A user buys a pack of 26 cards, which all contain a different concrete assignment. Some are small (buying a stranger a cup of coffee), and some require more effort (going outside and filling a plastic bag with litter from the streets). The user can choose in what order and tempo to commit the acts. Once the user has completed the assignment on a card, he tells about the experience on the web, using the identification code on the card. He then passes the card on to someone else (friend or stranger, openly or anonymously). The recipient of the card is stimulated to do the act as well, and share the experience on the Boom Boom Cards website. As such, the chain of kindness continues, and the card’s path can be tracked online. The text on the cards is written in a positive uplifting tone. Most assignments contain a subscript that invites the user to embark on a more ambitious mission. This will require more effort of the user, but will be more rewarding. A smart thing about Boom Boom Cards is that they focus very much on doing kind things for others, instead of presenting their product as a happiness-boosting strategy for the user. This gives the product a more authentic appeal, and makes it more meaningful, which may potentially increase the happiness of users even more. 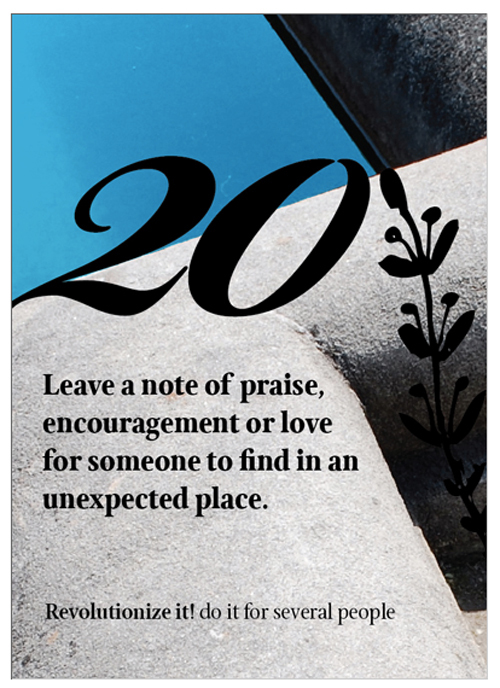 – Boom Boom Cards focus mostly on practicing acts of kindness, expressing gratitude and nurturing relations. Other strategies of Lyubomirsky are not included. – Boom Boom Cards are paper cards, while my design concept uses coins as a carrier for the assignments. It would be interesting to know the different implications that these carriers have for the use of the product. Having studied the testimonials on the website of Boom Boom Cards, it seems that people having bought the cards use them frequently, yet successive use is quite rare. Of all the 261 first acts that have been registered on the website in the last four weeks, only 12% have witnessed a successive act. 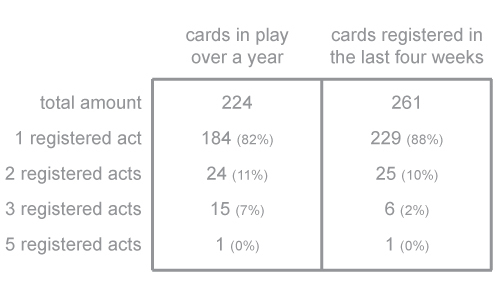 This figure does not change much when observing cards that have been in play for a longer time (giving the recipients of cards more time to perform and register their act of kindness). Of all the 224 first acts that have been registered over a year ago, only 18% have witnessed a successive act. This passing-on system does not work as well as it should ideally. One can imagine that initiators are naturally motivated to perform the acts; otherwise they would not buy the product. However, recipients of single cards still need to be motivated, and the only agents able to do that are the person giving them the card, the card itself, and the website supporting it. Akoha is an on/offline game, where users commit kind acts in the real world to score points in the virtual world. It is quite similar to Boom Boom Cards. Users complete an act described on a card, and pass it on to the recipient of the act. The recipient goes online, acknowledges the act of their predecessor, and the predecessor receives points for it. The recipient can then himself also carry out the act, pass on the card, and receive points. Play continues as the card is passed on and on. Besides the intrinsic reward of being kind, which is also offered by Boom Boom Cards, Akoha adds an extrinsic reward. ‘Karma points’, which are essentially experience points, can be exchanged by the player for prizes, access to events, and other things. 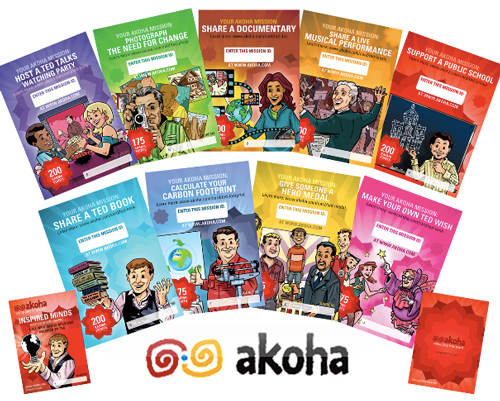 – Akoha features an elaborate virtual rewarding system where players can score points and appear in rankings. This competitive approach may decrease the authentic character of the game, although it may also increase motivation. A lot of things that were learned from these two case studies are relevant for my concept. The system of Boom Boom Cards is very similar to my own concept. It focuses mainly on the strategies of practicing acts of kindness, expressing gratitude and nurturing relations, thereby validating that for these strategies of Lyubomirsky, such a system can indeed help people with their adoption. The intention of my concept is that it will be suitable for the adoption of many more of Lyubomirsky’s strategies. Therefore, it is important to further develop my concept for strategies other than practicing acts of kindness, expressing gratitude and nurturing relations. During this development, Boom Boom Cards will be regarded as a benchmark product. 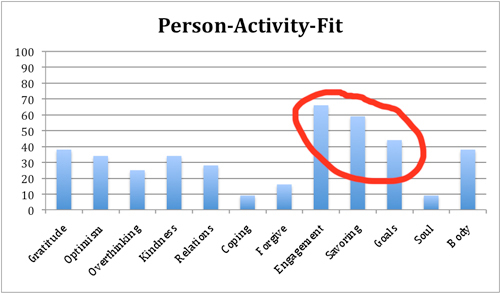 Observing that the participants in my context research have mainly been students, and knowing that this group has a preference for the strategies of increasing flow experiences, savoring life’s joys and committing to your goals, it would be wise to focus on exactly these strategies. – The communication of the product. By presenting the product as meaningful cause, instead of a happiness strategy, the concept becomes more authentic and meaningful. – The principle of ‘revolutionizing it’. By suggesting possible elaborations of the assignments, the more ambitious users are challenged, making the product more fun for them. The greatest challenge will be to make the passing-on more successful, by increasing the speed and length of the chains. This will be the main point on which my concept will differentiate from Boom Boom Cards. I believe that it is key to focus on the experience of the secondary users (the ones that receive the cards from others, instead of buying the product themselves), and increase motivation for them. 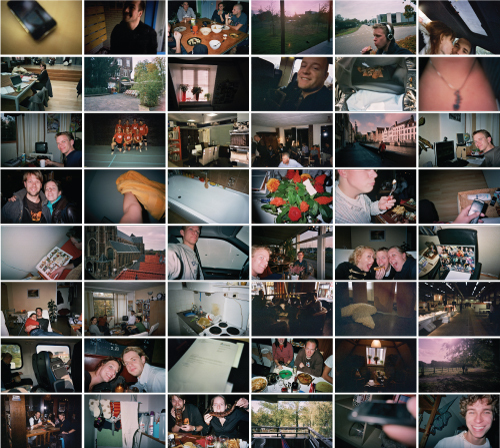 – The carrier of the assignment could be a physically more appealing and intriguing product. – The website could offer a more compelling story that could spur the user into action. These two elements should create a kind of ‘wow-experience’ that increases motivation of the secondary users. In the next stage of the project, I will present the new design of the carrier and the website, and work towards a prototype that can be tested with real users. After a thorough analysis it was finally time to get creative! In this post I’ll tell about my first ideas and concepts for a product that can help people adopt a happiness strategy in their daily life. The design focus is to combine elements of experiential learning (active experimentation and reflective observation) with the strategies of Lyubomirsky. At this point the main goal is to explore and generate ideas without too many constraints, as it is important to diverge in the early stages of this phase (Tassoul, 2007, p. 32). Hence, there is no focus on any strategy in particular, nor on a specific target audience for which must be designed. 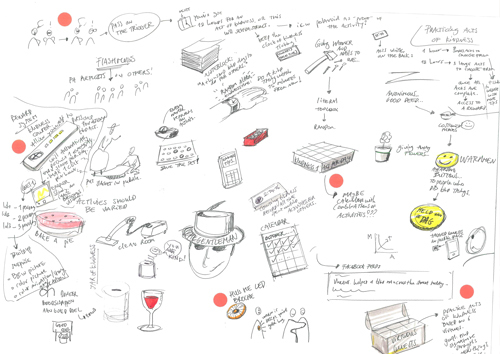 Ideas were generated during a number of sketching exercises. Different brainstorming and problem solving techniques were used to ensure a comprehensive result. This is an envelope with a thank-you message. Inside the envelope is another envelope with a thank-you message, with another envelope inside, etc. The envelopes are all sealed and already contain postage. The user that buys the product sends it to someone as a thank-you. When the recipient opens the envelope, he discovers that in turn he can thank someone by sending it again. Thus a chain of thank-you letters comes into being. The initiator of the chain is rewarded by the knowledge that he has set in motion a chain of thank-you’s. This is a hugging pole. It is intended to cause unfamiliar people to hug, without having to break through their comfort zones. The poles have humanly shapes, and are filled with air. When one pole is hugged, the air is transferred through underground pipes to another pole. The movement of air will cause the poles to shrink or expand, allowing people to ‘hug each other without touching’ by hugging the poles. 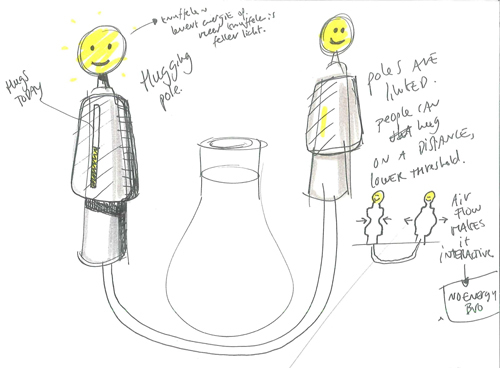 The poles could contain motivational elements, such as a hug counter ‘total hugs today: …’, or a head with a light that starts to glow when hugged. Two creative sessions were organized to generate an extra dose of ideas. I differentiated from my previous ideation, by choosing not to focus on Lyubomirsky’s strategies, but on Seligman’s framework of virtues (2003). There is a lot of overlap between Seligman’s framework of virtues and Lyubomirsky’s strategies, but there are some distinct differences. Lyubomirsky’s strategies are valuable because they have been tested intensively and are formulated on a concrete level. The translation from Lyubomirsky’s stategies to products should be easier than from Seligman’s list of abstract virtues. However, virtues are simple, elegant, and universally accepted concepts. They are authentic and meaningful, which makes them more socially acceptable for someone to pursue rather than more hedonic antisocial strategies. In that sense, virtues could be a successful communication strategy for a product that is based on a multiple of Lyubomirsky’s strategies. 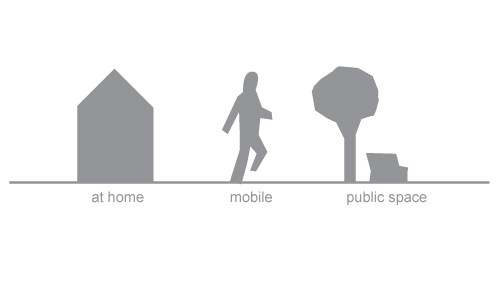 1) There are cardboard tiles for different domains: Work, Home, Public Space, Love, Leisure, Self, Family and Friends. The participants are asked to think of examples of the display of virtues in various domains. They must write their ideas on post-its, and put them in the appropriate domains. Each of the three virtues of the session is addressed for 10 minutes. 2) There will be a small competition, and the group is split into two teams. Each team receives 15 envelopes. Every envelope contains a paper with a strength written on it. All strengths are related to the virtues of the session. For every strength the teams have to make a chain association: strength > product > product > product. A3s with a grid and arrows are provided for every chain. There are some elements to inspire and motivate the participants, such as extra assignments hidden in the envelopes and a small prize. 3) Creating examples of using a product to stimulate the exercise of virtue in a certain domain. 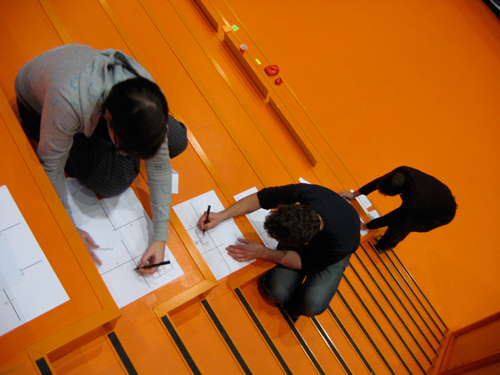 In groups of two, the participants will create two concepts, each combining a virtue/domain and a strength/product from the walls. The concepts will be visualized on an A3. 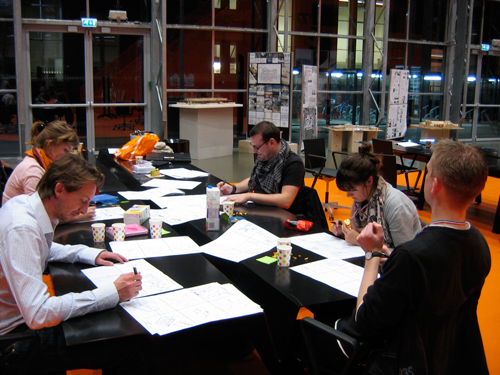 Afterwards, the teams will shortly present their concepts to the group, allowing some time for short discussion. The participants were quite able in combining the outcomes of the first two exercises into concepts during the third exercise. The sessions have generated loads of interesting ideas. The majority of them display strong relations with some of Lyubomirsky’s strategies. The sketching exercises and creative session resulted in a great variety of ideas of different shapes and sizes, which incorporated many different concepts of interaction. 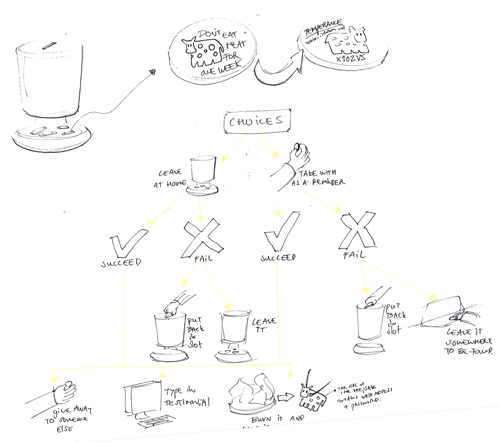 To find more focus and enable a good choice, the ideas had to be analyzed. 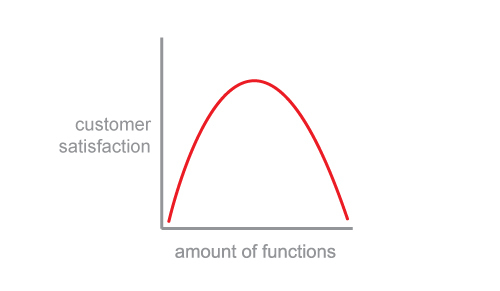 This graph represents the amount of functions in a product, and the user satisfaction with the product. When there are too few functions, the user is not satisfied because the product does not answer his needs. When there are too many functions, the user is not satisfied because the product is too complex, and offers him functionalities he does not need of want. An optimum has to be found where there is enough functionality but not too much. 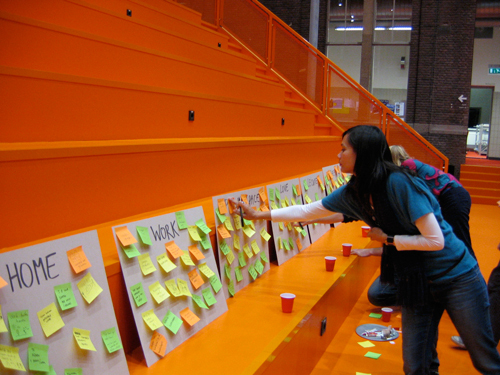 The product ideas fit into different contexts: Some are to be used at home, some in public space, and some are mobile. It seems that for active experimentation, a mobile product is most versatile, since it can be used in many contexts. For reflective observation one needs to be in a comfortable environment, thus reflective observation can best be done at home. Passing on products is an interesting mechanism. It can add value, since one small action by an initiator can lead to so many more. This potential chain reaction is an extra reward on top of the intrinsic reward of doing the act. Passing on the product also gives a sense of closure to following the strategy. When starting out with a lot of assignments, being able to give them all away will feel like an accomplishment. Finally, the factor of serendipity is interesting. People can be the lucky recipients of a kind act or of a trigger. Also, the initiator may stumble upon traces of the chain again, or may even track it in some way. This diagram shows the unique benefits of physical products compared to software, and vice versa. Unlike software, physical products afford physical interaction; can be used regardless of context (no need of a computer or Wifi network); and leave more room for human-human interaction. These aspects are all important when trying to evoke active experimentation. Unlike physical products, software allows for easy customization and user contribution, and is great at providing content and communication. 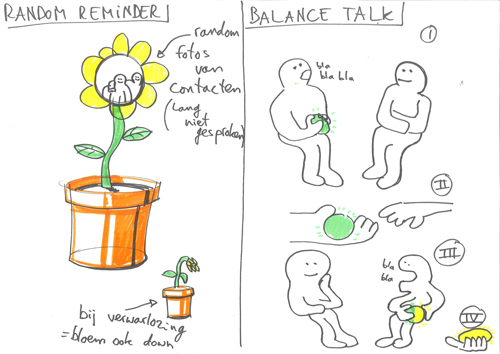 These aspects are all very suitable for reflective observation, where it is important for users to express, share and discuss their experiences. The concept direction is a generic system with specific products. One system with clear rules and functionalities, that contains simple products, customized to suit different users. The products should give the user small concrete assignments related to his happiness strategy, in the shape of examples and suggestions of activities and experiments. The products act as random triggers that inspire action, and should be passed it on as part of the lesson. The experiments give the user a different take on things. Using contemplation tools, the user reflects on his experience through a ritual. The products for active experimentation should be mobile and physical. The products for reflective observation should consist of software, and be used primarily in the home environment. Now that the concept direction had been described in abstract terms, it needed to be developed into a more concrete design. Theory on persuasion by BJ Fogg was used to aid this conceptualization. 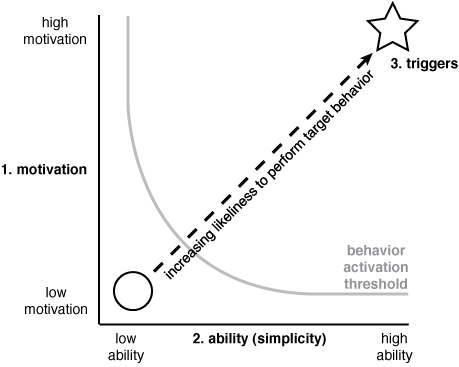 Fogg’s elements of motivation, ability and trigger are strongly related to active experimentation and others to reflective observation. These elements will have to be addressed in the final design. 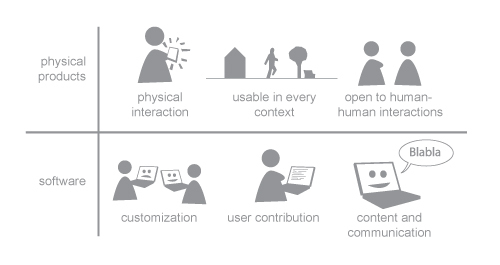 An interaction vision was developed for this purpose. Active experimentation: The product should give hope, inspire and reassure the user that it’s OK to try new things. Reflective observation: The product should allow the user to take some time for contemplation. 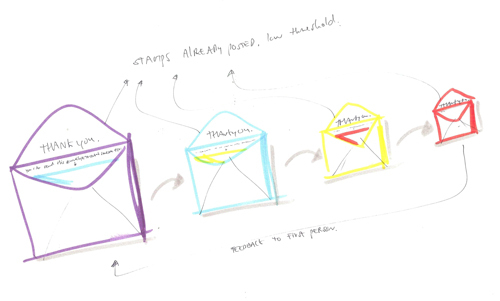 I have explored the interaction vision in sketches, gradually making the concept direction more concrete. After some iteration I formulated a preliminary concept description. A container with coins that have small assignments printed on them. 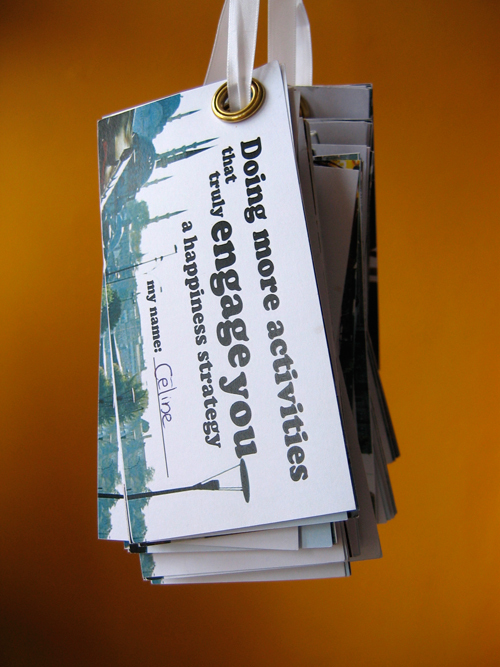 These assignments are related to the happiness strategy the user wants to adopt. The goal for the user is to empty the container, thereby making a habit of behaving in a way that fits his strategy. The assignments should have a low threshold by being fun, meaningful, concrete, and simple. They will still require some commitment from the user, otherwise he will get no feeling of achievement. After having completed an assignment, the user types a testimonial on a special website, and passes the coin to someone else. The recipient of the coin is meant to do the exercise as well, type a testimonial, pass the coin on to someone else, etc. On the website, all the testimonials that are linked to one coin will cerate a meaningful story for all people involved in the chain. The story will be a reward for the initiators, and a motivation for the recipients in the chain. The use of this product can be visualized in a storyboard, and consists of the following stages: Acquisition; unpacking and placement; receiving assignments; preparation; action and consequence; contemplation; progress; end of life. These stages were developed a bit further. Acquisition > The product can be bought online and at retail stores. If people buy it online, they can customize their coins by doing a PAF test. Retail stores have sets of coins for every strategy. Coins can have different colors so that they can be recognized easily. Users will come into contact with the product through the web, or by receiving a coin in real life. Unpacking and placement > The container has to be placed in a location in the home that is visible, so that it can remind users of their commitment. Therefore, it should look good and fit in people’s interiors. Maybe there should be no container at all? Maybe people should just use a bowl they already have at home which they like? Receiving assignments > To be open and flexible, all coins are available to the user at once. This also makes progress towards their goal very obvious. Maybe there can be a reward system: they will receive an extra coin by mail, upon having completed all coins of a certain strategy. This will encourage users to finish a strategy. Preparation > During the stage of preparation, the user can experience many emotions that either support or object the execution of the assignment. The threshold has to be low to minimize the chance of giving up. Therefore, the assignments on the coins need to be small, feasible and concrete. Action and consequence > The assignment should strive to offer an engaging experience, which is gratifying by itself. Action and contemplation shouldn’t interfere, as that could lead to a distorted experience. 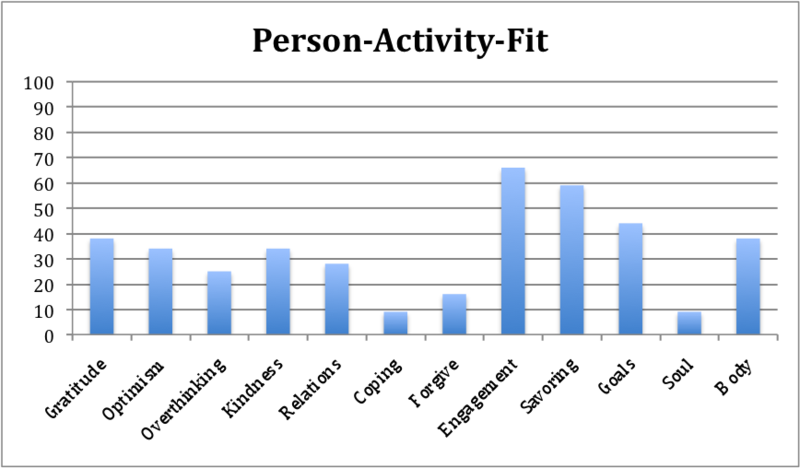 Individual assignments differ from social assignments. 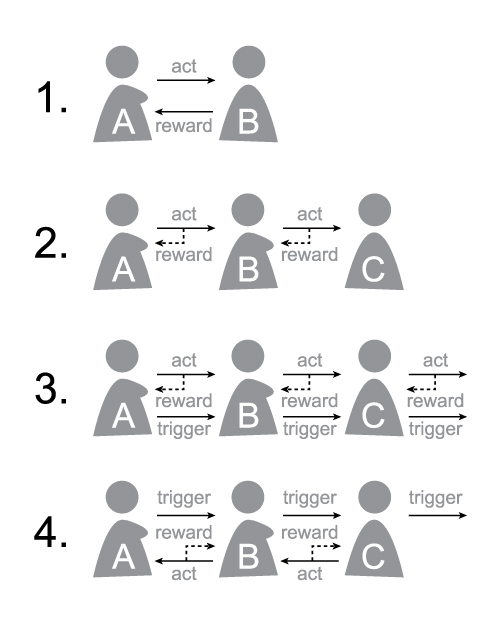 Individual assignments can be anonymous, while social assignments often involve interaction with other people, and will also concern the dynamics of reciprocity. Contemplation > In order to afford contemplation one needs a comfortable environment. The activity of contemplating can involve a form of expression to allow the user to rearrange his thoughts and put them into perspective. Action and contemplation shouldn’t interfere, as that could lead to a distorted appraisal. It would be suitable to reflect on assignments at home, through expressing, sharing and discussing experiences online. Progress > A user should be able to see progress in completing the assignments. A condition for observing progress is having an overview of the amount of assignments that have been completed, and the amount that still needs to be. Seeing progress can be as simple as seeing a bowl of coins slowly becoming empty. End of life > The product has reached its end-of-life when the first user has given away all the coins. However, the coins will be spread and create their own paths. The stories of all the coins remain on the Internet as a reminder. 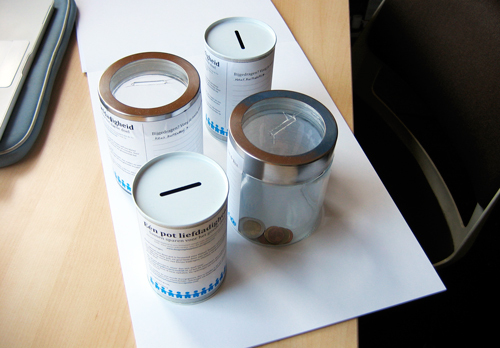 When the coins come in a container, the empty container is left behind when the coins have been given away. It may be put to some other use, such as a bowl or vase. In the next stage of the project, I will further develop the concept, and work towards a prototype that can be tested with real users. – Seligman, M. E. (2003). Authentic Happiness. London: Nicolas Brealey Publishing. – Tassoul, M. (2007). 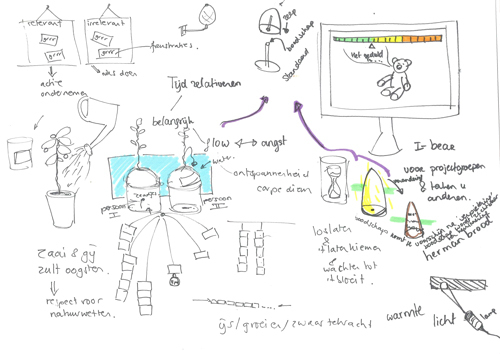 Creative Facilitation. Delft: TU Delft.